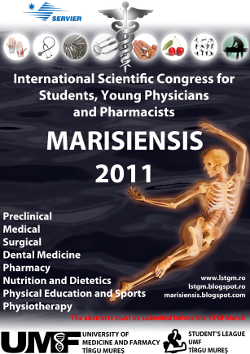 The Students League from the University of Medicine and Pharmacy Targu Mures organized the first edition of the National Congress for students, young doctors and pharmacists in 1995. During this time the event has become a tradition of Romanian medical comunity. Participants will present their scientific papers during three days ,from the 7th to the 10th of April,in the halls of the University of Medicine and Pharmacy Targu-Mures and Targu-Mures County Hospital. The papers will be judged by committees composed of respected professors of the Romanian medical community and they are going to award prizes and diplomas to the participants. The Congress is meant for students and youngdoctors. The abstracts and presentations must be writen and sustained in English *. * Optionaly, the presentations can be sustained in Romanian. © 2011 LSTGM. Programming by RNSS ™.